Trump’s national-security adviser understands the limits of military triumphalism. But can he change US policy? How did the world’s only superpower wind up in the middle of this war-crazy mess? The United States seems to be dealing with three or four enemies at once. Or switching sides when a renegade militia changes its name and allegiance. Or refighting old wars Americans thought they had already won. It’s hard to keep track, and lots of citizens have stopped trying. When the Cold War ended a generation ago, the United States took on the singular role of global peacekeeper, protecting or punishing other nations depending on their behavior and values. We spread troops and clandestine warriors in black among scores of nations to keep the peace. It sounded like a noble commitment. Now our so-called “indispensable nation” finds itself beset with confusion and contradictions, trying to cope with half a dozen or more irregular insurgencies, some hostile, some friendly. Instead of peace and tranquility, the American Goliath seems to attract a swarm of killer bees. Washington doesn’t know how to win in Afghanistan—or how to get out of it. At the moment, the war in Afghanistan is heating up again. The Taliban are recapturing the countryside and slaughtering scores of young Afghan army recruits assembled for weekly prayers, or blowing up Kabul. American hawks are once again calling for more troops, more arms, and more money. President Trump sent National Security Adviser H.R. McMaster to survey the troubled scene and propose a new strategy. This is an old story. The United States has been at war in Afghanistan for nearly 16 years. “New” strategies were also proposed by Trump’s predecessors, but none of them succeeded. Washington doesn’t know how to win this war or how to get out of it. Modern warfare, it seems, does not require victory or defeat, just hanging on. On this perverse battlefield, adversaries fight with different weapons. Our side has the wondrous tools of high-tech weaponry, like precision bombing by pilotless drones or video terrain maps for tank commanders. The other side has, in addition to the usual tactics of guerrilla warfare, terrorism, including the deployment of children wearing suicide bombs as jackets to blow up a crowded marketplace. Yet, strangely enough, the gravest threat to America is not these foreign terrorists. It is a threat closer to home that political leaders don’t wish to talk about: We endanger ourselves. What pulls us deeper and deeper into violence is American hubris—the false pride of our triumphalist pretensions. What pulls our reluctant citizenry deeper and deeper into chaos and violence is American hubris—the false pride of our triumphalist pretensions. The assumption is that our authority in the world ultimately relies upon our awesome destructive power. The US monopoly on deadly force is supposedly justified by our noble intentions—protecting world peace. During the Cold War rivalry, both sides competed, mainly on matching nuclear arsenals, but they did not make the mistake of launching direct war against each other (prudent strategy for both sides). Without the Soviet empire, Goliath was stuck without a rivalry or clear purpose. Instead of promoting a general drawdown in weaponry and strategies, the United States and its NATO partners enlarged their franchise—they were no longer just defending the homeland but now reforming the world. In particular, America dispersed fighting forces and command centers to nearly every continent. These deployments were intended as warning flags for bad guys—don’t mess with the United States—but some bad guys didn’t get the message. And American right-wingers promoted a far more aggressive agenda of changing dozens of supposedly roguish nations that did not comply with our governing values. Iraq was high on the list. The murderous 9/11 terror attack provided the trigger for a generational restart of war-making. Goliath was ready. Having made themselves the fearsome giant of good intentions, American military leaders felt they could not back away from shooting wars without experiencing utter shame and cowardice. Yet if the United States were to use its full-strength power to kill and conquer, it would destroy its good standing among nations. So the United States clumsily decided to have it both ways. The Bush/Cheney war on Iraq was launched with a battle slogan that expressed the arrogance of American power: “shock and awe.” Bomb the crap out of them, and they’ll surrender without a fight. People like the sound of our claim that we are a mighty nation that is both virtuous and deadly dangerous. In war and peace, Americans seem blinded by their power. People like the sound of our inflated self-confidence—our claim that we are a mighty nation that is both virtuous and deadly dangerous. We further protected ourselves from harm by acquiring still greater killing power and inventing more ingenious ways of delivering destruction. Terrorism effectively undermined that reassuring premise. Terror can’t win on a traditional battlefield, but it might succeed in deranging Goliath. The governing elites have no real solution for this dilemma, so they keep faith with the old formula for deterrence—the threat of massive retaliation—even though it no longer deters. In the history of nations, hubris is dangerous territory. Over-wrought pretensions of superiority have brought down kings and empires. Failure to recognize new power realities has led great nations to tragic endings. Does it sound far-fetched to suggest that the United States is now endangered by hubris? Some old soldiers have observed the symptoms. As a young military officer, McMaster realized that the easy US victory in Desert Storm was profoundly misleading. As a young tank commander in 1991, H.R. McMaster performed brilliantly in the short, successful war called Desert Storm. Captain McMaster’s unit of nine Abrams tanks destroyed some 80 Iraqi tanks and other vehicles, and McMaster was decorated with the Silver Star. Yet he realized afterward that the easy US victory in Desert Storm was profoundly misleading and encouraged American war-fighting in disastrously wrong directions. But McMaster recognized that military leaders were themselves misled by their swift and overwhelming victory. American power, the Pentagon strategists assumed, would rule in this new, post-Soviet world. American technological advantages would invent weapons of the future that could literally reinvent the nature of war. “Ebullient optimism…followed the triumph of capitalism and democracy over communism and totalitarianism,” McMaster explained. Without naming names, McMaster explained: “The hero vainly attempts to transcend human limits and often ignores warnings that portend a disastrous fate.” McMaster perceived such “overconfidence” in the so-called “shock and awe” precision strikes. “Hubris permeates the language of defense transformation,” he wrote. Warnings by McMaster and other officers were ignored. Disaster did indeed follow. As a colonel, McMaster was admired as a gutsy iconoclast, but he was twice passed over for promotion to brigadier general. His perspectives have changed a lot in 15 years, but the same challenging questions need to be asked. Is the United States launching bombs and missiles or sending more troops to Afghanistan to accomplish plausible strategic goals that are in America’s interest? Or are the generals just trying to protect Goliath’s reputation as the toughest guy on the block? American hubris was further encouraged by a convergence with the extraordinary digital technologies emerging at the same time. Some giddy military theorists proclaimed the advent of a “revolution in military affairs” that would lift the “fog of war” by bringing precision and certainty to the chaos of battle. Certainly, targeting is greatly improved, and battle commanders have real-time knowledge that informs their tactics. But the visionaries of high-tech war sometimes sound like they’re hallucinating. McMaster didn’t buy it. “Under these constructs,” McMaster explained, “wars would be efficient and even more humane. Near perfect information would make possible precise application of force from great distances which would, in turn, reduce the risk to US forces, minimize ‘collateral damage’ and even make the battlefield a safer place for the enemy.” Making war safer for the enemy? Wow. That is visionary. In fact, when McMaster studied war-fighting doctrines published by the armed services, he found a shocking omission. “The enemy is generally absent from these descriptions of future war,” he wrote. “When the enemy does appear, he is quickly overwhelmed by American strength and the interactions between forces is limited to the application of US military power followed closely by enemy capitulation.” That is hubris as a formal policy. You might call it “dream war.” Lots more explosives, but not as many people get hurt. New war-fighting machines that kill from a long distance with incredible accuracy. And there’s no pilot error, because there are no pilots. Computers do the targeting, even fly the planes. This very pleasing fantasy evaporated once the other side started turning children into bombs, religious faithful into sacrificial killers. The “new” new US strategy has attempted to put people back into the story—organizing and encouraging reconnections within local populations instead of simply bombing their communities and attacking local insurgents. 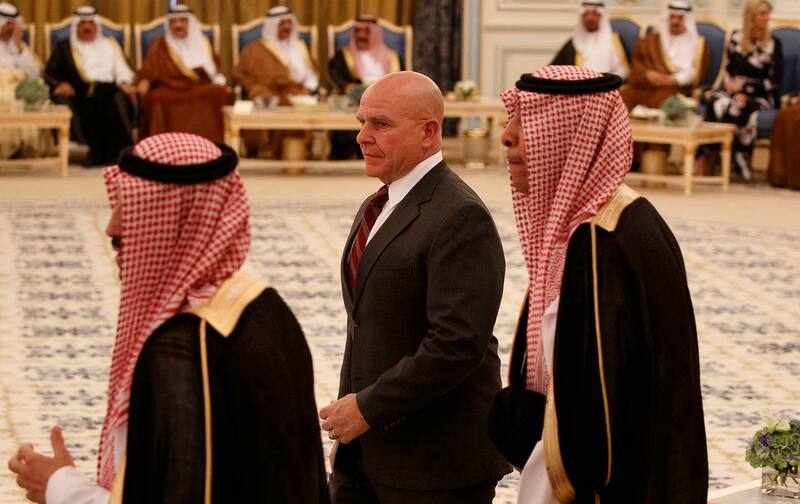 McMaster has been a leading force for this counterinsurgency doctrine in both Iraq and Afghanistan, calling for improving social conditions like health and education while fighting corruption and warlord politics. Building stronger communities for the Afghan people while bombing the Taliban may seem like a virtuous project, but it’s not yet clear that it can succeed, not without years and maybe decades of US subsidy and military protection. American peacekeeping missions fail in Afghanistan and elsewhere because they are trying to straddle two contradictory goals—the violent conquest of native insurgencies, along with humanist healing for people in severely deprived societies. It’s not obvious that either of those goals can be achieved separately. But the straddle sets up continuous collision between warriors and health givers, in which the American interest is impossible to define confidently, much less sustain politically. One month we may be building schools and hospitals. The next month we might blow them up. This is not a sustainable posture. Americans can provide assistance in good faith; they do in many places, and that is certain to continue. But the truly rough challenge confronting Americans is to reexamine ourselves and discard a lot of pieties that are not good for us or for the world. That doesn’t mean dropping out. But we are not in charge of running the world. Nor are we obligated to fight in every other war that comes along. This is a hard conversation for Americans to have, since it will be misunderstood and is sure to provoke patriotic distemper. On the other hand, Americans like to argue, and there is a lot to argue over. Personally, I’m tired of arguing over wars and where—or why—we should fight them.